Luxury jewelry fanatic or not, you most likely recognize the iconic Alhambra motif from Van Cleef & Arpels Jewelry. The clover-like shape, enshrined in a gold setting and dotting a long chain, is a time-honored fan favorite. We explore the Maison’s signature design’s history, its initial inspiration and the craftsmanship dedicated to producing each of these delicate pieces by hand. The clover-shaped charms were introduced in 1968 and quickly became a signature design of the Maison. To Van Cleef & Arpels, the clover is a symbol of luck, health, fortune and love. The collection was also an immediate favorite of Princess Grace of Monaco’s, a longtime avowed devotee of the Van Cleef & Arpels brand. Princess Grace collected long strands of Alhambra necklaces made of coral, tortoiseshell and malachite, an opaque brilliant green mineral. After its initial heyday, the Alhambra remained popular, although more quietly so. The collection saw a resurgence in popularity in 2001 after it again became a celebrity favorite. Today the unmistakable Alhambra Collection enjoys a prestigious rank as a symbol of luxury. The clover shape is borrowed from the Moorish quatrefoil which is a framework detail whose pattern is drawn from the outer edges of four overlapping circles. Historically the four-lobed, clover-like shape appeared at the tops of Gothic arches, within stained glass and affixed above doorways. 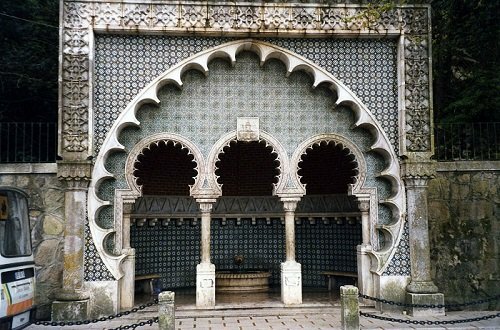 And it was the collection’s namesake Alahambra Palace in Granada, Spain—with its ornate and scalloped archways—that particularly influenced the final design. Move the slider below to compare the Alhambra Palace and the Van Cleef & Arpels icon. Van Cleef & Arpels’ jewelers abide by rigorous standards to produce the jewels of the Alhambra collection and ensure they’re nothing short of perfection. The jeweler begins with sourcing materials for the clover’s settings like turquoise, diamond, onyx carnelian, malachite and mother-of-pearl. In order to vet out only the best stones and minerals, any material used must first pass through a 15-point inspection. The focal material is then shaped and polished into the classic Alhambra clover motif. 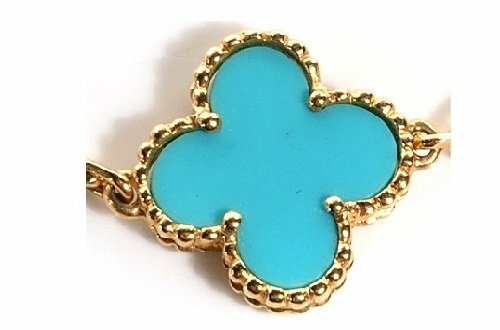 The gold frame that outlines the clover is separately shaped and hand polished. The setting is then finished by hand for a flawless fit and polished a second time. Meanwhile each link of the gold chain necklace is thoroughly inspected to ensure the links are uniformly shaped and secure. Finally the chain and gold settings are carefully assembled by hand. The stone-setter then delicately but firmly secures each Alhambra motif within its gold setting, again by hand. After its final polish, the jeweler inspects the finished product to guarantee it meets Van Cleef & Arpels’ lofty standards.